Meet Rex the German shepherd. While most dogs live uncomplicated lives of frisbees and walks, Rex is among the proud few serving with a law enforcement K-9 unit. But even among his fellow police dogs, Rex stands out from the pack: He’s been trained to be haunted by an unsolved murder from 2005! Whoa. Looks like not all heroes walk on two legs! 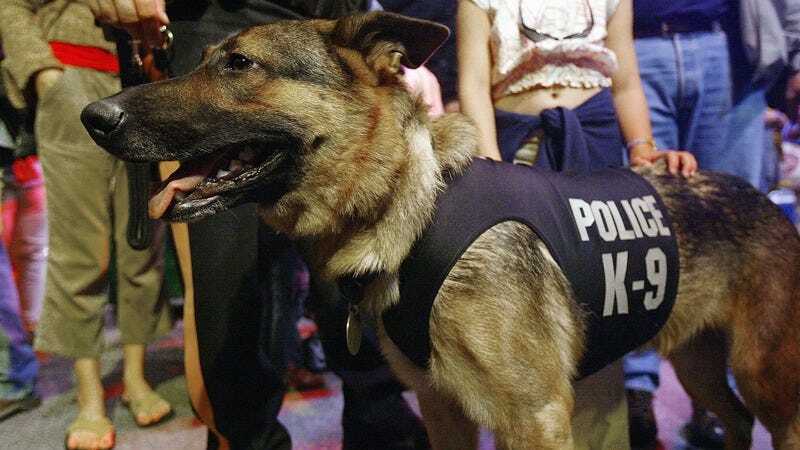 Thanks to a rigorous program of specialized training and conditioning, Rex’s handlers successfully got him to relentlessly fixate on the 2005 waterfront homicide of a John Doe, a cold case the rest of the department had long forgotten. Instead of sniffing out drugs and chasing down perps, Rex now spends his days pacing fitfully near the back of the evidence lockup, lashing out at superior officers, and abandoning his beat to chase down even a whiff of the same Nat Sherman cigarettes as those left at the crime scene. And Rex has rapidly adapted to his new training, first dropping 15 pounds and then gaining nearly 40, as the constant stress of his obsession has taken its toll on his diet and sleep habits! Ask anyone at his precinct, and they’ll tell you the same thing: Rex is haggard, he’s stopped taking care of himself, he’s distracted in the field, and he just won’t let that 2005 case go. The results speak for themselves: This dog is incredible! Incredible. If this canine champ doesn’t convince you that man’s best friend deserves that title, nothing will. Thank you for your service, Rex, and good luck with the case!